During a brief visit on the PACROFII conference tour, 9 quartz samples were collected from the accessible dumps at the site. Decrepitation analyses were carried out on 0.5 grams of each sample and the results are plotted in the following 2 graphs. These samples are all very similar, indicating the homogeneity of the deposit - at least in the area represented by the samples collected. It is not common to see such consistency of decrepigrams in a group of 9 quartz samples - even samples in close proximity to each other. This suggests a quartz origin from a single depositional event, possibly over a limited time span, from a single fluid composition at a single temperature. There is no evidence in these samples for a gradual cooling of the formational fluids during the deposition of this quartz. The samples also show unusually symmetrical peaks and lack much decrepitation at the quartz inversion temperature of 573 C. This again suggests a very uniform set of fluid inclusions with uniform size and composition. There does seem to be a slight difference between samples 1606 (2003A) and 1610 (2003E) and the other 3 samples in the first plot. These 2 samples have a "tail" of decrepitation leading up to the main peak, which is absent on the other 3 samples. 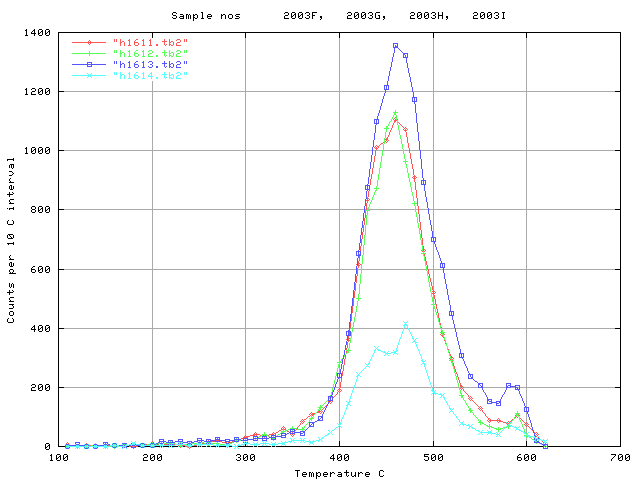 In addition, there is a hint that the main peak is at slightly lower temperature (450C) instead of 460C as seen on the remaining 3 samples and the samples in the second plot. However a 10 C temperature difference is not reliably measurable given the instrumentation reproducibility limits, and is only tentative. The Black Bull silica deposit samples are remarkably homogenous and formed from a fluid with a single stable fluid temperature and of constant composition composition. This is unlike typical hydrothermal quartz. The lack of low temperature decrepitation below 350 C indicates very low to no CO2 component (or other non-condensible gases) in the parent fluid. 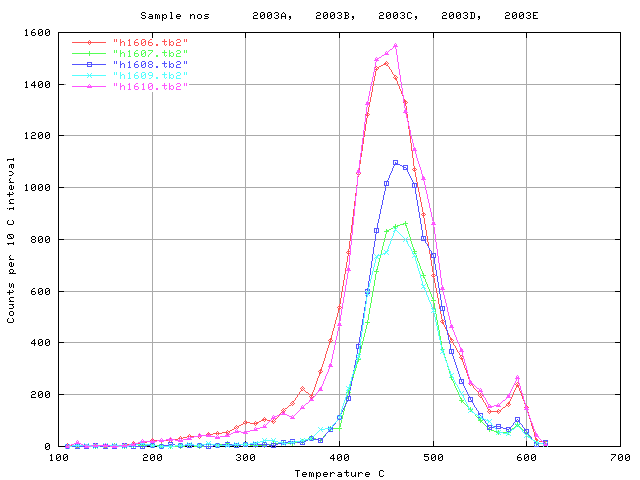 Sample 2003F (red above) was examined microscopically to try and understand the unusually narrow decrepitation peak.